It has been requested that this article be rewritten and expanded to get official names of the minigames and include any missing minigames. The Goal in Super Mario Land 2: 6 Golden Coins (also called Stage's End) is an event found at the end of most levels in the game. The goal consists of two options to choose from: A door which will simply complete the level, and a bell which will allow the player to play a bonus minigame when hit. 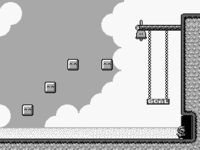 Usually to get to the bell, the player has to jump on platforms or other obstacles to reach it. If the player hits the bell, a minigame begins. In the Crane Game, the player has to press the to make the moving crane drop and collect one of the rewards, which are moving on a conveyor belt. The rewards vary between levels, but usually contain power-ups and 1-ups. Collecting the reward will have it take an immediate effect on Mario. This page was last edited on April 9, 2019, at 15:39.